Presently, sixteen families are recognized within the infraorder Mygalomorphae. Many are fossorial (adapted to digging and life underground) trapdoor spiders. The names attached to these families are imposing, and difficult to pronounce. If you take the time to delve into the etymology of these names, you will find a rich history. For example, the name Cyrtaucheniidae (pronounced sir-tawk-en-EE-uh-dee), of the superfamily Cyrtauchenioidea is — as all good taxonomical names might wish to be — based on first impressions of the organisms to which it refers. 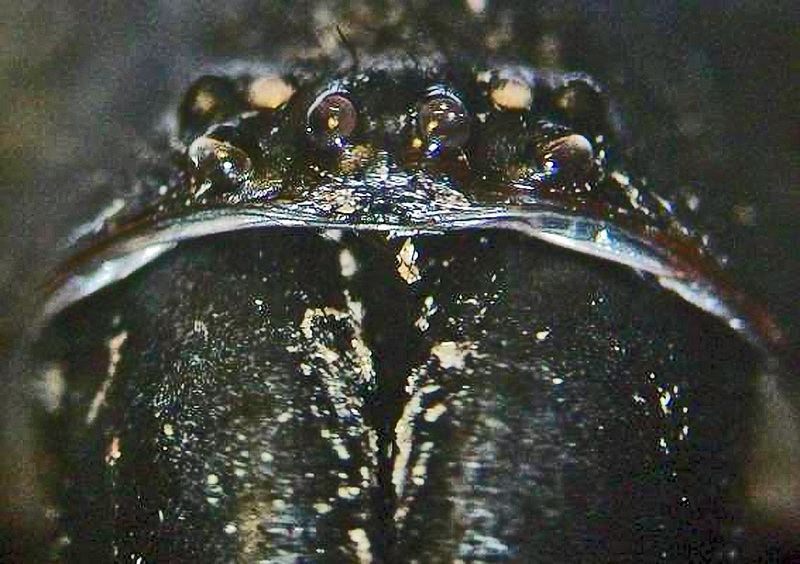 A similar name, cyrtocephalus, was first described by the French entomologist Hippolyte Lucas (1814 – 1899), in 1843 for a genus of trapdoor spiders now placed under the Cyrtaucheniidae family. That early generic name was replaced by cyrtauchenius in 1869 by the Swedish arachnologist Tord Tamerian Teodor Thorell (1830 – 1901), and the family name Cyrtaucheniidae was assigned by the French arachnologist Eugène Simon (1848 – 1924) in 1892. This is said to be a reference to the generally observed fact (viz. 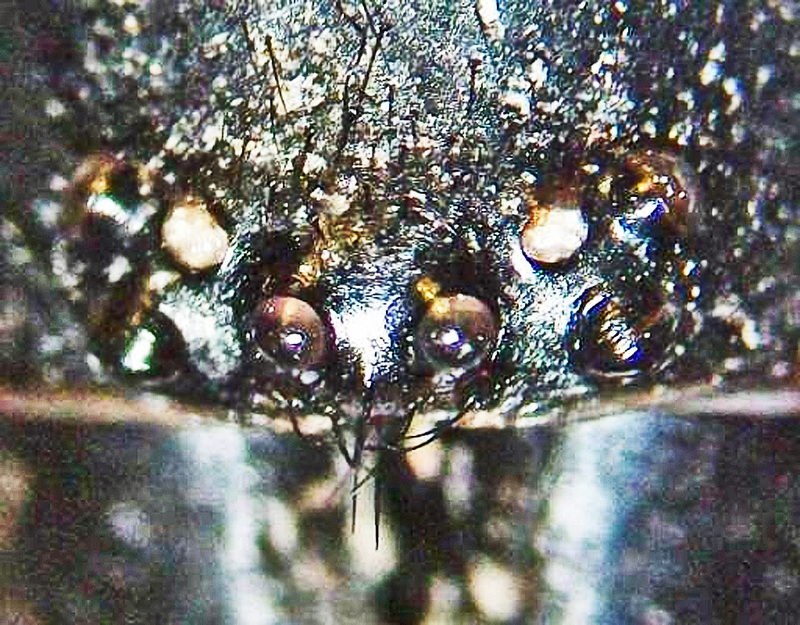 the photo at the head of this article) that the pars cephalica of these spiders is highly elevated above the pars thoracica of the cephalothorax. The enlargement of the uppermost photo shows that, in fact, the “neck” of the specimen from Austin does have the appearance of being arched, and bent upward, so that the eyes of the spider seem, at first glance, to be facing upward as well. 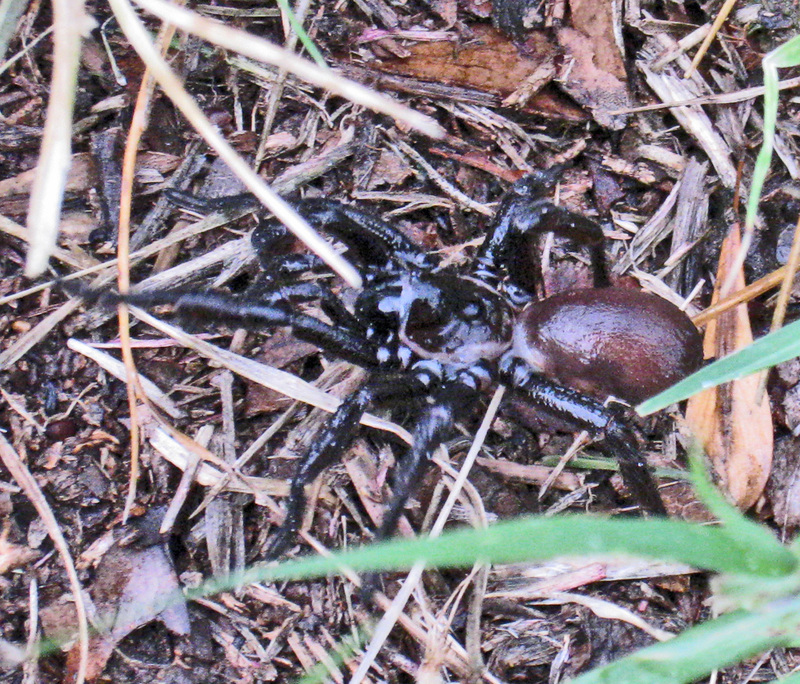 This is partly an illusion, as photos of another, similar trapdoor spider found in Kempner, Texas, show. But the illusion is compelling, and helps explain why the appellation was used in reference to these spiders. Beccaloni, Jan. 2009. Arachnids. University of California Press, p. 56. Comstock, John Henry. 1914. The Spider Book. The New Nature Library, Vol. Seven, Part Two. Doubleday, Page & Company, p. 249. Emerton, James H. 1883. The Structure and Habits of Spiders. S. E. Cassino & Co, Publishers, pp. 44-51. Foelix, Rainer F. 1996. Biology of Spiders, Second Edition. Oxford University Press, pp. 267, 270. Gertsch, Willis J. 1979. American Spiders, Second Ed. Van Nostrand Reinhold Company, pp. 27, 121-122. Kaston, B. J. 1978. How to know the spiders. McGraw Hill Company, pp. 40, 60-62. Levi, Herbert W. 1990. Spiders and Their Kin. Golden Press, New York, p. 23. Platnick, Norman I. 2011a. The World Spider Catalog, V. 12.0; FAM. ANTRODIAETIDAE Gertsch, in Comstock, 1940: 236. American Museum of Natural History.